In response to the growing immigration of the 1840’s, a nativist movement began to develop throughout the eastern United States. Roman Catholics were frequently the target of controversy in Maryland with the creation and request for government financing of the parochial school system. Local fire brigades also tended to be Irish Catholic, and their sometimes-violent competition with one another added to the growing resentment. This xenophobic sentiment solidified into the creation of the Native American party at a conference in Philadelphia in 1845. This political party stalled while the country focused on the Mexican War, but after the Compromise of 1850, the nativist sentiment reemerged. Secret societies such as the Order of United Americans and the Order of the Star-Spangled Banner formed. When questioned, members were to respond that they knew nothing about the group. These Know Nothings established themselves as the American party in 1854. They further strengthened their ranks with disenchanted Whig members. The focus of the American party was to elect native-born men to political offices and to create a 25-year residence restriction for citizenship. Additionally, Maryland members of the American party sided with a growing temperance movement. The American party was extremely successful in Maryland. Its candidates won in the municipal elections of Hagerstown and the mayoral election of Baltimore in 1854. By 1857, the Know Nothings had captured the House of Delegates and witnessed Thomas Hicks sworn in as governor. The elections of 1856 within Baltimore City were particularly noticeable for their violent and illegal voting practices. Seeking to add southerners to their party eventually lead to the splintering of the American party. At the June 1855 convention in Philadelphia, Southern members seized control and adopted a pro-slavery platform. As a result of this issue and the passing of the Kansas-Nebraska Act, anti-slavery Know Nothings left the American party and joined the new Republican party. 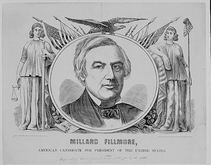 Millard Fillmore ran for President in 1856 on the American-Whig-Know Nothings ticket. Only Maryland issued its electoral votes to the former President. In Maryland, the Know Nothings were forced out of state office by 1859 when the Democrats seized control. In an effort to staunch the American party within Baltimore City, the city police were put under state control, voting practices were regulated, and the recent election results were voided. STANDARD 3: The extension, restriction, and reorganization of political democracy after 1800. Standard 3A: The student understands the changing character of American political life in "the age of the common man." TITLE: The Great Know Nothing Song, "I Don't Know"
TITLE: The "Know-nothings" & the "Savage" by "Timid"
DATE CREATED/PUBLISHED: May 30, 1854. TITLE: Tricks of the enemy! "Know nothing" Falsehoods!! 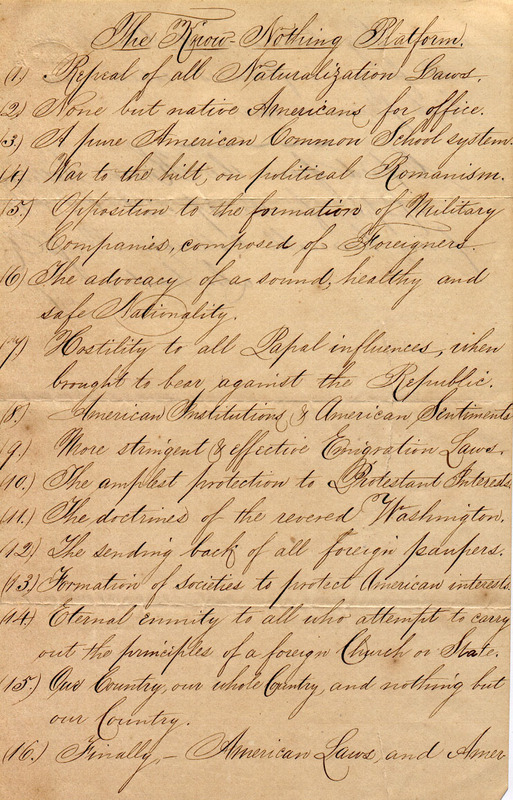 SOURCE: The Abraham Lincoln Papers at the Library of Congress. Series 1. General Correspondence. 1833-1916. DATE CREATED/PUBLISHED: October 9, 1856. Anbinder, Tyler, Nativism and Slavery: The Northern Know Nothings and the Politics of the 1850s. New York: Oxford UP, 1992. Baker, Jean H. Ambivalent Americans:The Know Nothing Party in Maryland. Baltimore: Books on Demand, 1977. Baker, Jean H. The Politics of Continuity: Maryland Policitcal Parties from 1858 to 1870. Baltimore and London: Johns Hopkins UP, 1973. Beals, Carleton, Brass-Knuckle Crusade. New York: Hastings House Publishers, 1960. Bladek, John David. "America for Americans: The Southern Know Nothing Party and the Politics of Nativism, 1854-1856." (Ph.D. dissertation, University of Washington, 1998). Bowers, Douglas. “Ideology and Political Parties in Maryland, 1851-1856.” Maryland Historical Magazine. LXIV Fall 1969, 197-217. Gienapp, William E. "Nativism and the Creation of a Republican Majority in the North before the Civil War." The Journal of American History, Vol. 72, No. 3. (Dec., 1985), pp. 529-559. Hicks, John D. "The Third Party Tradition in American Politics." The Mississippi Valley Historical Review, Vol. 20, No. 1. (Jun., 1933), pp. 3-28. Holt, Michael F. "The Politics of Impatience: The Origins of Know Nothingism." The Journal of American History, Vol. 60, No. 2. (Sep., 1973), pp. 309-331. Levine, Bruce, “Conservatism, Nativism, and Slavery: Thomas R. Whitney and the Origins of the Know-Nothing Party.” The Journal of American History 88.2 (2001): 93 pars. 28 Nov. 2003. Price, Sean. Junior Scholastic; 12/3/93, Vol. 96 Issue 8, p13. Note: Relates the Know-Nothing Party's murder of 20 immigrants in Kentucky in 1855. Rampage through immigrant neighborhoods; Anti-immigrant and anti-Catholic party; Origin of their name. Silbey, Joel H. “Know-Nothing Movement.” Grolier Incorporated, 2000. Steiner, Bernard Christian. The Patriotic Marylander. 1915, Vol. I, 34-42. The Life of Henry Winter Davis. Towers, Frank. “Violence as a Tool of Party Dominance: Election Riots and the Baltimore Know-Nothings, 1854-1860.” Maryland Historical Magazine. 1998 93(1): 4-37. White, Jr., Frank F. The Governors of Maryland 1777-1970 (Annapolis: The Hall of Records Commission), 165-170. Some journal articles linked to this site require password access due to copyright and other restrictions. Teachers participating in the Teaching American History in Maryland program with a valid University of Maryland (UMBC) Library card can access these materials through ResearchPort. This document packet was researched and developed by Traci Siegler.